The overall reliability and performance of EuroClone - BioAir Contamination Control Equipment (CCE), are evidenced by their presence in research laboratories, hospitals and industries worldwide. Behind our success lies a story that combines the strict observance of the current international standards, the skilfulness of our craftsmen and the total commitment to serve our customers according to their expectations. EuroClone - BioAir is one of Europe’s leading manufacturers and suppliers of highest quality Microbiological Safety Cabinets, Laminar Flow Cabinets and Recirculating Fume Cupboards, with more than 35 years of experience in manufacturing and promoting these instruments we continue to strengthen our position in the global marketplace. High confidence in the equipment produced by EuroClone - BioAir, together with flexibility in production and thorough knowledge of our customers requirements, enable EuroClone - Bioair to offer the right solution for every need. 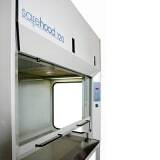 Following its wide experience with safety cabinets and storage of dangerous products, ECOSAFE-leading manufacturer of safety cabinets-uses its entire technical knowledge to design and manufacture its fume hoods LABOPUR®. Made in EU, the ductless fume hoods LABOPUR® stand out by a high manufacturing quality and fi nition. The entire process being controlled with the European standard ISO 9001 -2008. Ductless fume hoods LABOPUR® provide the user a secured work space for the repetitive manipulations of small chemicals quantities. The dangerous vapours are confined in the enclosure, then are cleaned while entering the active charcoal filter. Finally, dangerous vapors are rejected in the atmosphere without danger for the environment. Thus, the user’s health is protected, conform to the norm NF X 15.211,version May 2009. UV-Air Flow Cleaner-Recirculator operation principle is based on a constant, forced air circulation through recirculator`s chamber in close vicinity to UV lamps, thus ensuring maximal efficiency of disinfection. The inner mirror surface of recirculator chamber reflects ultraviolet rays thereby increasing the density of UV radiation and enhancing the disinfection effect. 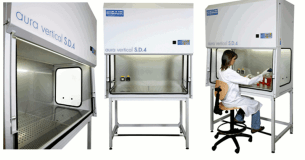 DNA/RNA UV-cleaner boxes are designed for clean operations with DNA samples. They provides protection against contamination. All models are bench-top type, made of metal framework, glass (or plexiglas) walls and working surface painted with powder enamel or made of stainless steel. UV-cleaner boxes are equipped with an open UV lamp installed in the upper hood. UV-radiation from the open lamps disinfects the working area inactivating DNA/RNA fragments during 15–30 min of exposure. A digital timer controls duration of the direct UV irradiation. A daylight lamp provides proper illumination of the working surface.